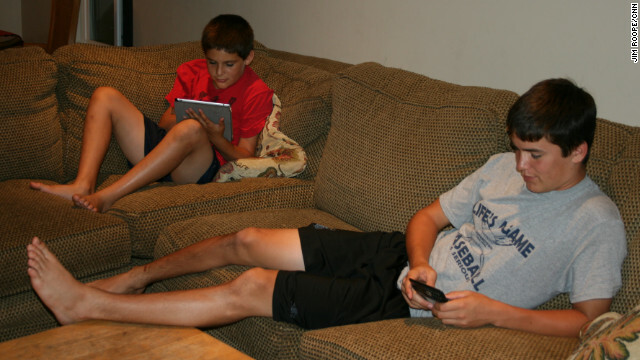 Ryan and Matthew Porras keep connected to their parents, friends and each other through their mobile devices. Editor's note: This story is part of the in-depth CNN series, "Our Mobile Society," about how smartphones and tablets have changed the way we live. (CNN) - Many parents complain that mobile phones, computers and tablets are dividing families. However, some experts are saying these devices actually bring them closer together. Scott Coltrane, Professor of Sociology at the University of Oregon is one of those experts. Coltrane said mobile devices help parents and their kids feel better connected to each other. Steve Ruggles, Director of the Minnesota Population Center and Professor of History and Population Studies at the University of Minnesota, said kids communicate more with their parents today than in generations past. It’s all about how the family embraces this technology and how the parents manage it for their children. How are mobile devices impacting your family? Listen to the complete story above and join the conversation below. I liked this discussion about how these techs affect the family. I think it’s important parents to limit their use by kids because there are a greater probability of kids using these devices to play or to do things that their parents wouldn´t like. I agree with Michael Buckley that people are become lazier because of technology. Then it is necessary parents use a good sense in this case! I keep hearing about a guardian app that lets parents control when and how kids use their technology. It can change as the kid grows older, but parents don't have to worry about addiction, etc. I think this is what will resolve the problems. I am really inspired with your writing abilities as neatly as with the layout on your blog. Is that this a paid subject or did you modify it yourself? Anyway keep up the excellent quality writing, it is rare to peer a nice weblog like this one nowadays..
Its just new technology phenomenon, just like television last time, we cant control it. Its how we control the situation. We're already in the mobile society. Thank you for your comment and welcome. We will do our best to offer insightful, real, interesting and meaningful stories for you. I'm sorry to see that CNN has bought into this notion that digital culture is making life better. From where I sit, I see kids who are obsessed with their phones, use them for all the wrong reasons, communicate less effectively, and are generally less intelligent and lazier because of technology. Is it really healthy to stare at a computer screen all day and night? Thanks for the comment. However the story is not about how the digital culture is making life better. It's about how families use digital technology. In the story we clearly point out that many kids abuse these devices and cut themselves off from their families. It's all how parents "manage" these devices, set rules and consequences for violation of the rules and then sticking to the rules and consequences. The story is about a family who found these devices beneficial through the way the parents do what many parents do not do, and that simply is parenting when it comes to these devices. More than just the decision to purchase a mobile phone or other device for you kids is the management of those devices. Has mobile technology changed your family? Do your kids have phones or tablets? How do you manage the useage to keep your kids from "getting lost" in the devices? What's your advice about mobile technology and the family?